This Eurocup Group A clash in Croatia on Wednesday night sees as team with a 1-2 record taking on a side with a 2-1 record and a taste for victory. This means that we could be in for an exciting evening and there will definitely be some interesting basketball betting options to look out for. The hosts received a boost this week with the capture of Marko Tomas. It is too early to say whether Tomas will come into the line-up for this game but his signing is likely to boost the home fans and it could even spur the Zagreb players on. One Cedevita player that has been in fine form this season is Miro Bilan. This is a player with an average of 13 points per game and if the hosts are to take anything from this game, it is likely that Bilan will be the player that makes the difference. Other key players for the Zagreb side include Filip Kruslin with an average of 9.7 points per game and Mirza Begic, who has served up an average of 7.7 points per game. 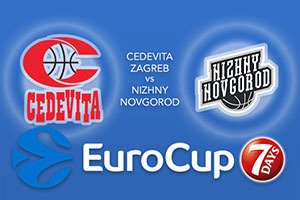 The side from Novgorod have won two games in a row and they will be determined to make that three wins out of three in Zagreb. The Russian side are in a good vein of form at the moment and the presence of DeAndre Kane is vital. He has grabbed an average of 15.3 points per game this season, which has been instrumental in some of the victories. Other key players for the Russian side include Ivan Strebkov with an average of 13 points per game while Siim-Sander Vene has provided an average of 11.7 points per game so far this campaign. The bookies think the hosts will see this game through in style but look to take Nizhny Novgorod at +8, which is provided at odds of 1.90. If you’re keen for the Over/Under market, look to go UNDER 157.5, which is on offer at odds of 1.90. Bet Now!